Price is $.25 each, sold in bags of 100 pieces. Handcrafted and created in the same fashion as in ancient times. Color and size vary, most are 1-1/2" to 2" in length. 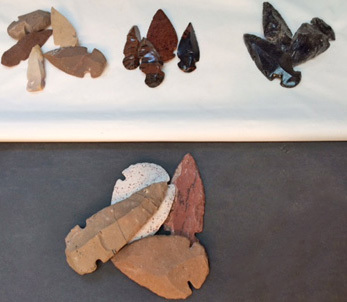 The light colored (Tan or Brown) are Chert Arrowheads. The black glassy looking ones are Obsidian. Chert is a common surface rock that is frequently called flint,. hornstone or jasper. May be brown, red or tan in color. Obsidian is a naturally occurring volcanic glass formed as an extrusive igneous rock. It is produced when lava extruded from a volcano cools quickly and without crystal growth. Because of the lack of crystal structure, obsidian blade edges can reach almost molecular thinness, leading to its ancient use as projectile points,i.e., arrowheads and primitive cutting tools,and its modern use as surgical scalpel blades. Mahogany Obsidian is a deep reddish-brown with black inclusions. The distinctive coloring comes from high concentrations of iron. NEW: Larger CHERT arrowheads now available! These $1.00 pieces are sold in bags of 25 pieces for $25.00.